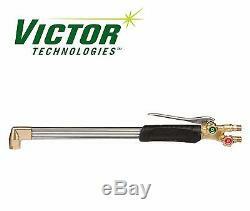 Victor Equipment (ESAB) ST411C Cutting Torch 21, Oxygen Acetylene Propane. The ST411C straight torch features the patented contoured handle whose size and shape fits naturally in most operators hands. The handle uses an engineered zinc-aluminum alloy called Zamak that has three times the tensile strength of brass, so it better resists deformation. The handle is lighter than brass, yet it balances naturally when hoses and attachments are connected. Head Angle - 90 deg. For use with all fuel gases (Propane or Acetylene). Color coded valves with labeled knobs. Founded in 1948, we are a proud, three-generation, family-owned and operated business. Leading the industry in scrap and demolition supplies, we can provide you with all of your torching, welding, and safety needs. Stocking over 300 long torches and 4,000 tips, we carry the highest-quality brand names. We are committed to offering exceptional products and service at a great price. You can count on us to know your business and take care of you personally. Tracking information will be provided. All orders are processed during that time frame. Damage inflicted by the user is not covered. The item "Victor Equipment (ESAB) ST411C Cutting Torch 21, Oxygen Acetylene Propane" is in sale since Thursday, April 14, 2016. This item is in the category "Business & Industrial\CNC, Metalworking & Manufacturing\Welding & Soldering Equipment\Welding\Welders, Cutters & Torches\Gas Cutting Torches". The seller is "torchandweldingsupply" and is located in Houston, Texas. This item can be shipped to United States, Canada.